10161 Dixie Hwy Ira Twp, MI. | MLS# 219003461 | The premier resource for all real estate information and services in Metro Detroit. 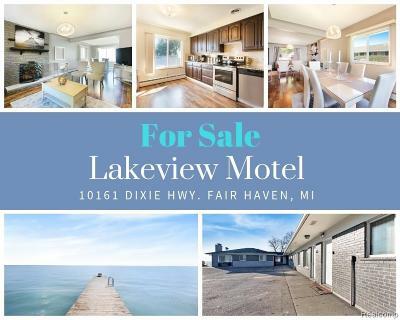 Last chance to own a luxurious boutique motel on the stunning Lake St. Clair. Watching the sunset through the window of the tastefully remodeled two bedroom house with gourmet kitchen, Brazilian granite counter top, backsplash and brand new appliances. This beauty also features a chic Cottage house, 8 Junior deluxe suites, two double bed rooms and 5 single rooms. The property has been listed on busiest travel websites such as Booking, Expedia and Hotel. Com. Also in partnership with Evolve luxury vacation homes. Take part in ownership while living on the property or operate it remotely as all the locks have been digitized. Hurry and come up with your offer as you could be the next lucky owner of this lakefront property.